On the journey through the evolution of life, I have found myself to be in the midst of mysterious awe. I am so blessed to have been guided to be a part of Earth Peoples United, the non-profit organization- but also in the greater sense of realizing our inherent Unity. It feels like I am continually being offered opportunity to become One with the essence of All. In finding ways to be of service to our relations, we are able to have the honor of strengthening the whole circle. I am growing in understanding as I wake each day to a new way, building upon the foundation of my consciousness and exploring the realms of possibility. In our spiritual pilgrimage to Patziapa, a Ceremonial and Healing Retreat Center on the shores of Lake Atitlan, Guatemala- we encountered many amazing moments. It was a divinely aligned experience, as each one is and offered each individual present, the opportunity to learn and grow immensely in a short period of time. We had a cosmic and connected group of people whose paths were destined to weave together, co-creating in the formation of something very beautiful and sacred. 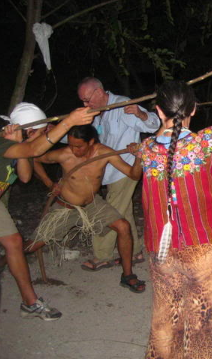 To have the opportunity to Be in Ceremony and stay at an ancient, sacred site of a civilization such as the Maya, is not something we have everyday. To those of us who were lucky enough to manifest this in our lives, we have been very blessed to glimpse an opening to this door in our consciousness that was activated during our retreat. I feel it was an incredible Blessing to re-connect with all of my soul family present, and especially to feed the fire of our connection to the Spiritual and multidimensional worlds- through the ceremonies and offerings of prayers, gifts and silent acts of reverence. It was a great honor to have been blessed with the presence of local, indigenous Mayan Spiritual Leaders, Healers and Wisdom Keepers at Patziapa. Tata Pedro Cruz Garcia, from the Atitlan Council of Mayan Elders has a beautiful message to share with humanity at this time of Great Transformation: the Unification of Ancestral Wisdom.